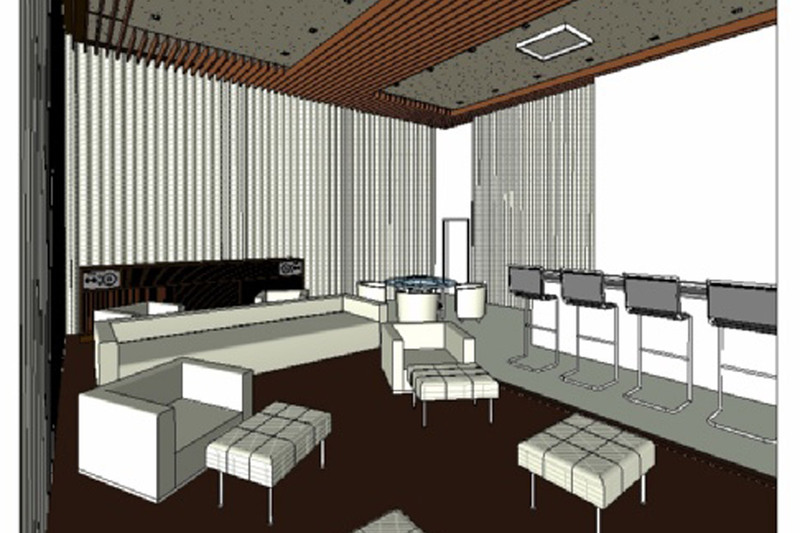 Preparing to move to a palatial new penthouse in Belo Horizonte’s prestigious Belvedere section, our client decided on a substantial upgrade to the home theater built in his original apartment. 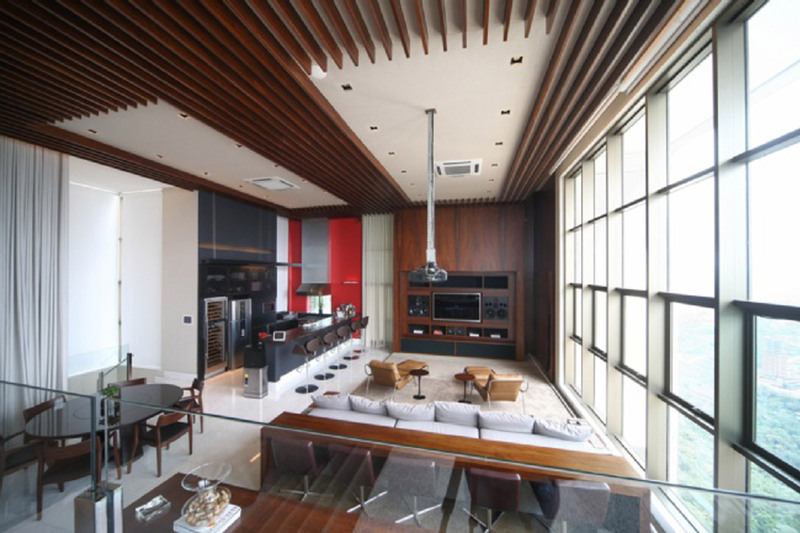 Recognizing the need for high level technology and meticulous acoustic treatments to provide exceptional sound AND eliminate noise leaking into (or out of) his home, he reached out to WSDG Brazil for technology recommendations, design, and construction supervision. 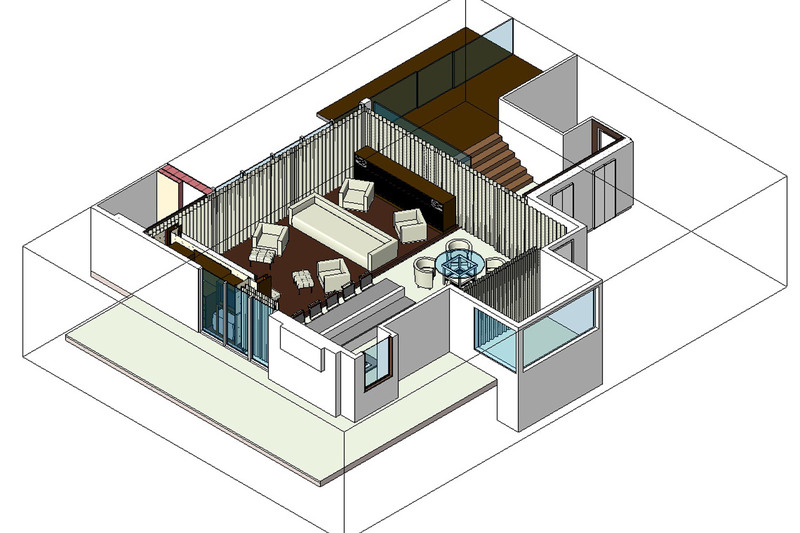 Beyond concerns for sound intruding to the bedrooms directly beneath his new home theater, he was committed to shielding his neighbors from noise infiltrating the two elevator shafts which service homes on the floors below his in this luxury condominium. To eliminate sound leakage to the lower level WSDG built a suspended floor over vibration isolators which greatly minimize the transmission of noise from the subwoofers to the residential section of the apartment. High STC acoustical doors, providing over 40dB of isolation were installed to prohibit sound from reaching neighboring apartments via the two elevator shafts. Additionally, cuts were made in the floor in front of the Adam Sub24 subwoofer mounted inside the custom front cabinet, to compensate for their vibration. Adam S2Aspeakers were mounted on the outside wall facing the lap pool. 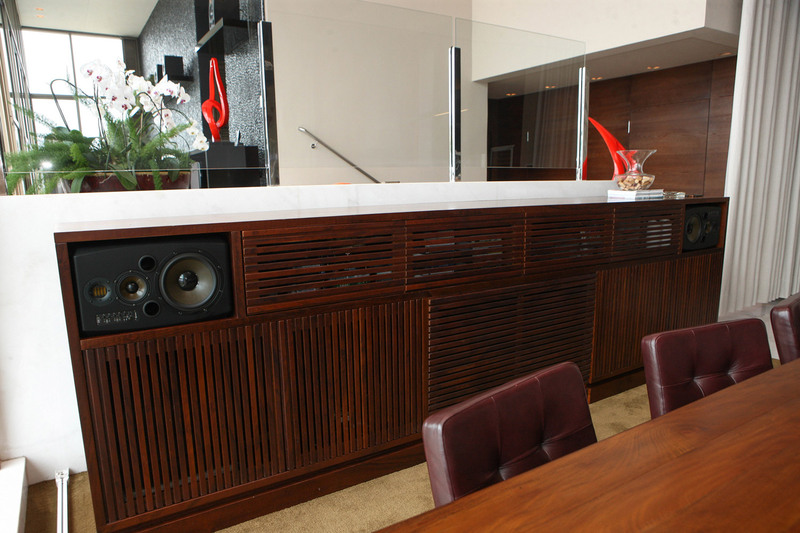 And ambient sound speakers were installed behind the screen to improve sound for a private dinning space. 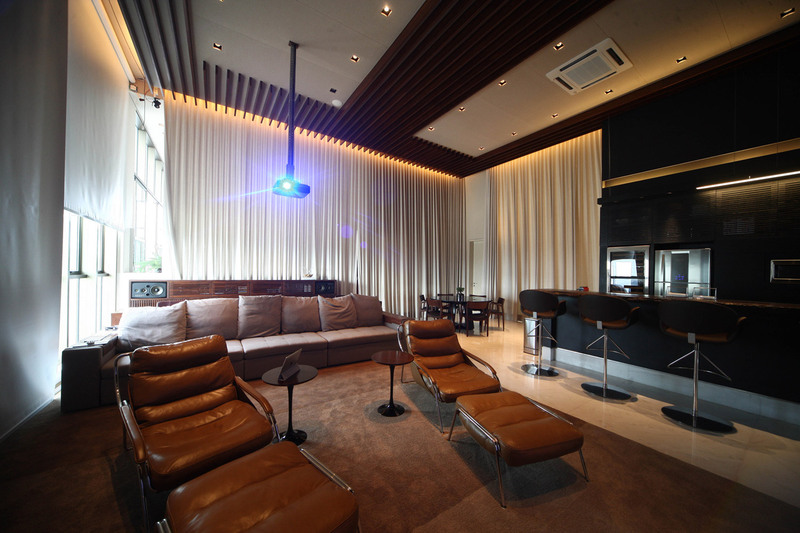 Beyond the 1200 SF/110m2 home theater, the loft-like entertainment complex features a 860+ SF/80m2, open-style gourmet kitchen with an expansive marble counter and custom stools to accommodate additional screening guests. 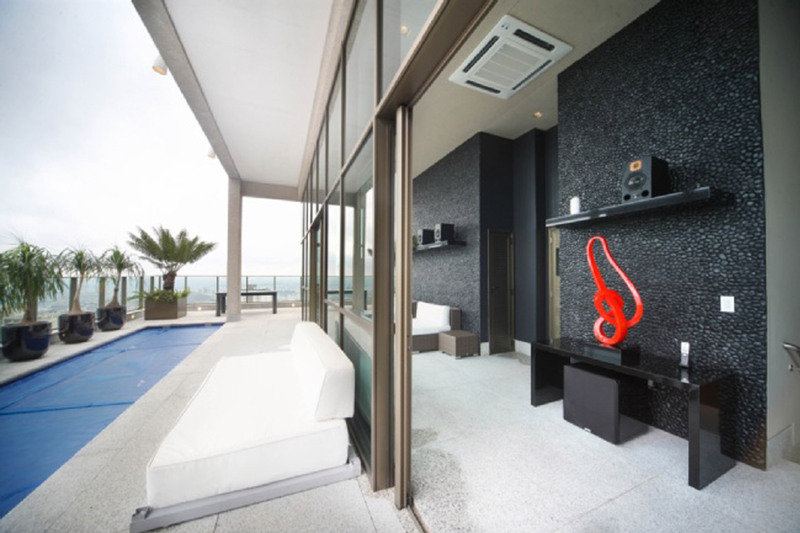 Soaring 14 ft. H x 45 ft. W glass walls provide views of the private lap pool, surrounding city, ocean and mountains. Acoustics were further enhanced by a perforated acoustic treatment mounted at a precisely calibrated distance from the slab on a wooden-slat-dressed ceiling for proper sound absorption. 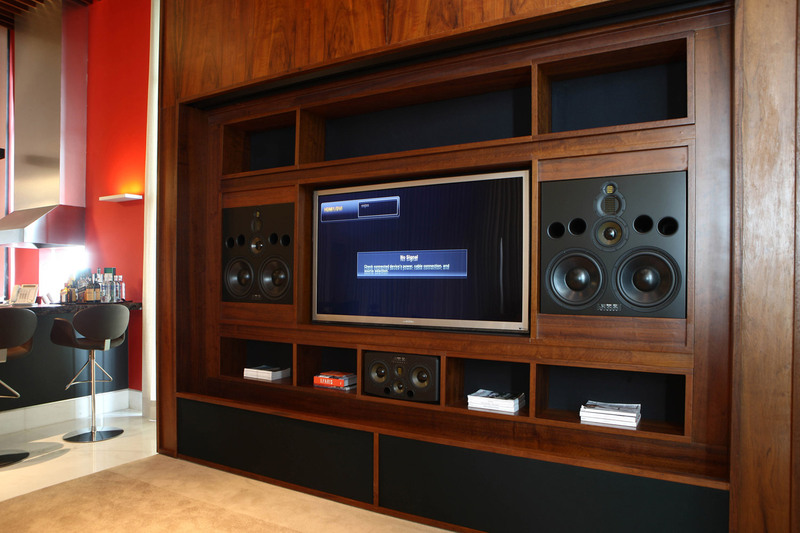 A 60” Samsung flat screen was set within the custom wall unit for small groups. 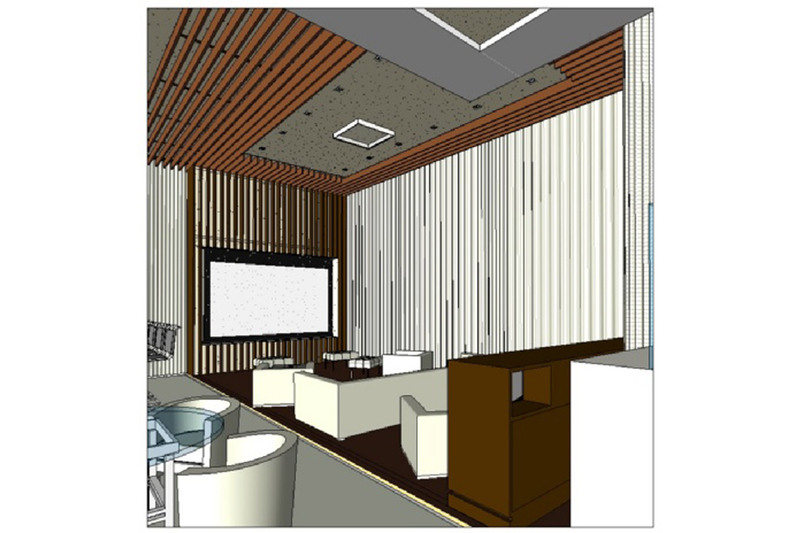 To insure optimal viewing for larger gatherings a motorized, 140” perforated THX certified screen was installed to provide theater-quality images from the Panamax Max 5100 ceiling-mounted projector. A sophisticated Xilica XP8080 was installed to expedite fine-tuning of the studio quality Adam S5xH main L&R speakers and Adam surrounds and subwoofer. This home theater is a showplace in every sense of the word.